Similar to the other book I am going to review and pick out the information that I found most helpful when creating a children’s book. The information in here will most likely be similar to the other review so I might be repeating myself or if I do miss points out it’s because they are already in the other post. Start with a character – where do they live? What kind of things would they have? Work with someone else – if your not very good at making a story but loves to illustrate. Try and find someone who is willing to collaborate with you. Have fun and give your sketchbook a theme for example food or cats. It may be difficult to try and stick to a certain theme but it doesn’t matter if you start drawing all sorts and its not linked with the theme. Many sketchbooks ‘die’ because you have everything ready, your sharp pencil, a black pen, a rubber ready to rub but then you don’t know what to draw! Well in this book the answer they have given to this problem is … just draw something! You can draw from location or just random objects in your room. As long as you draw something you never know when it might come into use. Now that you have an idea of what your story is going to be about, this book moves onto how to start a book. Always start with roughs or visuals to start to get your ideas onto paper as this will help you to see your story in illustration form. Remember these are roughs and they do not have to be perfect or even legible as it is good to get the rubbish ideas out the way before you can focus on the good ones. Sketchbook work – use your sketchbook to go out to specific places and draw from observation so for example if you need to draw a lion then go to the zoo or if you need to draw a crowd of people go to a shopping centre. Drawing from observation can be the key to finding out how your character will look as you can see how they move, look and how they generally look. By drawing from observation you can see how things interact with other things, this allows you to be able to exaggerate things so the book gives the example of someone walking ion a windy day – they tend to lean forward into the wind. By exaggerating something it can make it humorous and the reader can relate to how it feels. By exaggerating something of the character it can make them look funny and make them more interesting to the character, it may also help to illustrate the characters personality. Don’t create the stereotypical characters, it doesn’t always work. Sometimes it can be helpful if you want to put a point across but there is a danger the character will become generic and boring. For example the book suggests a witch, the stereotypical look for a witch is a warty nosed, chin curving up, long hair and missing teeth. But to develop this character into something interesting ask yourself following questions; What kind of witch is she… is she scatty, a clean witch who loves pretty things, does she have a gentle way or does she have problems buttoning up her coat. Another way to develop a character is to get in the mind frame of them – imagine what they eat, what they hate. You may not use these answer in your illustrations but it will definitely help help you to define them. Draw your character over and over and over. Draw them in different positions with different emotions as the emotion factors are very different from one another. Crying will have a totally different face shape compared to smiling. Also put them in different light as their shading and shape may look totally different compared to when they are standing in broad daylight, get to know your character inside out as this will help improve a solid storyline. This book goes into great detail on how to develop a character e.g. is your character dressed or undressed, are they an animal or human, what colours would you use. In the previous review they suggest making a dummy book as you will be able to tell what works and what doesn’t, do some of the illustrations fall into fold and lost. 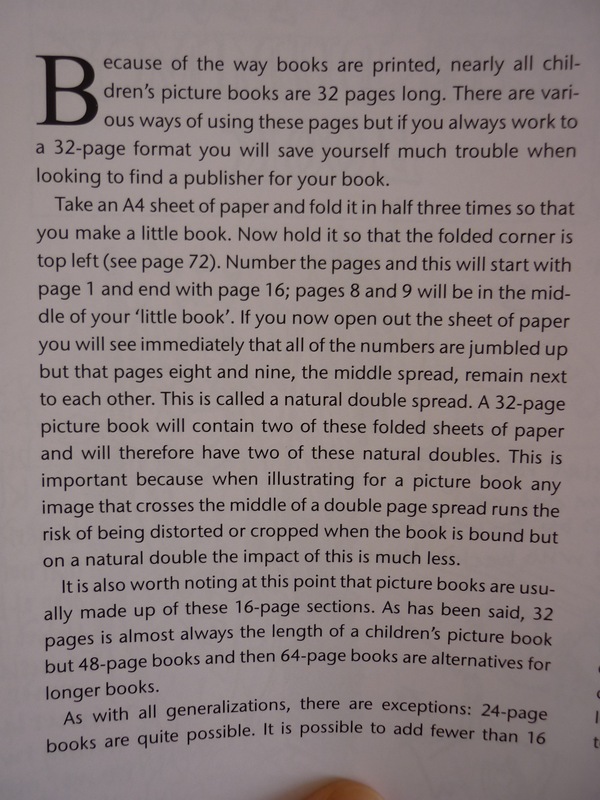 Usually picture books are 32 pages long – pages 32 and 1 being the front and bad cover. Pages 2 and 3 being the end pages and pages 4 and 5 being the title page. It may seem a little confusing but you will soon grasp the concept. I am now going to sum up some other interesting pieces of information that I found within this book. It is unlikely that every page or piece of work you will turn out exactly as you hoped but don’t worry! Don’t get stuck into trying to sort out one page as you might miss something more wrong in another page, sometimes a page you didn’t like actually turned out pretty good. Its all swing and roundabouts when making illustrations. 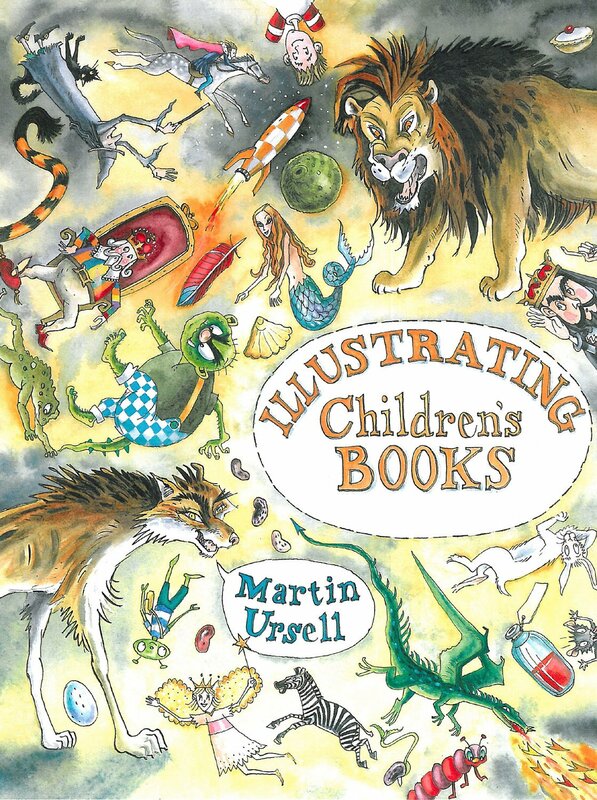 The rest of the chapters have very similar information to the last book I reviewed so see blog The Bloomsbury Guide to Creating Children’s Books – review to read more information. Overall, I find this book very good as it has a large action on how to develop a character and what to consider for example asking question on what the character is like. Even though there is a lot more text than pictures compared to the Bloomsbury book it has a lot more info ration that isn’t too complicated and it feels like it wants to help you in a weird way. Amazon., [internet] Available from:http://ecx.images-amazon.com/images/I/91tiqNl3QyL._SL1500_.jpg, [Accessed 15 March 2014, 3.34]. Ursell. M., 2013, Illustrating Children’s Books. Wiltshire: The Crowood Press. This entry was posted in Illustrating Children's Books by Martin Ursell - review.